For Thanksgiving I usually leave the traditional dishes to my sisters, and I make something a little different. 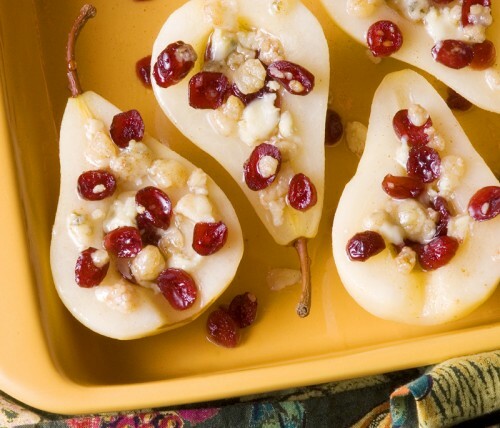 These simple roasted pears will serve as a side dish with turkey, or a not-too-sweet dessert. I use sweet wine, a dash of sugar and cinnamon, and sharp-rich gorgonzola for a tantilizing contrast of sweet and salty. Use Bosc pears for their firm aromatic flesh and pretty shape, or D’Anjou for a juicier result. Prepare the dish a few hours ahead, then pop in the oven 30 minutes before serving. Have a delicious Thanksgiving! PREHEAT oven to 425° F. Halve, peel, and core pears. dish. Add pears, turning to coat with wine. Place cut side up..
centers. Cover dish with foil. pierced. Serve warm, drizzled with liquid in pan. Recipe created for Sun-Maid Growers. Photo and styling by Kelly Burgoyne. There are so many varieties of pears that they are available nearly every month of the year. Unlike most fruit, pears ripen off the tree. In fact, turning mealy if allowed to stay on the tree past maturity. Other than Bartlett pears that turn yellow when ripe, most pears do not change in color. So how do you know when a pear is ripe? The USA Pear Bureau says, Check the Neck™: Apply gentle pressure to the neck of the pear with your thumb. If it yields to pressure, it’s ripe. Love this idea, Rosemary! Sounds dee-lish and easy. Can I use brown sugar in place of white? How about maple syrup or honey?